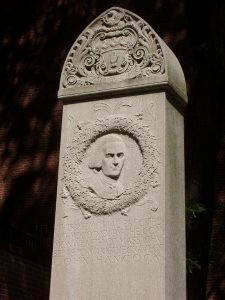 Am I the only one who sees the irony in the John Hancock Memorial Marker? I guess in MDCCCXCV (1895) the childish humor just wasn’t there. Or people found it funny but nobody said anything until they erected the marker (pun intended). Reminds me of that Family Guy episode where they parodied John Hancock as having changed his name from “John Footpenis”. Interesting, example of something done 100+ years ago that would possibly be offensive by todays standards because of his name and the phallic shape. Just shows how society’s perception of things as simple as shapes change. As does it’s sense of humor. On a more serious side, it’s interesting that this was done during the lifespan of Sigmund Freud who had some interesting views on this type of stuff. Obelisks have been associated with phallic imagery since early Greece… it was originally quite intentional, as a symbol of power. If you really want to bend your mind, take a look at a map view of Washington D.C. with the Capitol at the head of government, the White house as the right hand, Lincoln at the feet, and the Washington Monument at the… center.